Hm. 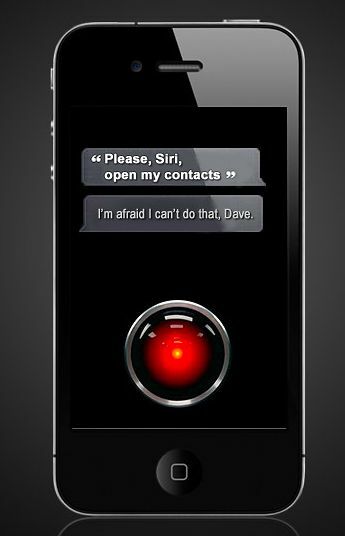 What if Apple’s Siri is learning from us? Many have tried to build artificial intelligence. Apple, thanks to the popularity of the iPhone, may be the first to succeed by crowdsourcing responses from its Siri assistant. Siri is an application in the iPhone that answers questions, looks up information, and can take basic orders such as setting an alarm clock. Pundit Andrew Sullivan recently noted the program improves over time by collating user questions and requests, and learning from whether responses are accepted. Big software spread across millions of people provides more than a service, you see — it also taps into all those users as a free research pool, and can improve based on user feedback. One joke in tech circles was Google gave away a free phone-number-lookup service called GOOG-411 for a while, getting millions of people to voice in questions, and then pulled it — because Google had finished human trials of voice-recognition software and no longer needed us for its product development. Siri is doing a similar thing with humans today — except instead of just queries for phone numbers, we are asking it almost anything. Millions of humans are directing Siri to do things or find information, and if Siri fails, we ask again in another way. Somewhere in the cloud Siri is collating all of this information to become smarter and smarter at answering, and anticipating, any question. Siri is learning based on the biggest data model in the world, millions of real human minds. Decades ago a World War II code-breaker named Alan Turing came up with a concept of how to tell when artificial intelligence exists: if the system can fool a human observer into thinking it is intelligent, then for all intents and purposes it is. This became known as “the Turing test,” and modern prognosticators such as Ray Kurzweil believe that as computer speeds become faster and faster, eventually software systems will reach the point when they are for all intents intelligent — and will then surpass us. But more than simulation is required; true intelligence requires aspects such as learning from experience, creativity, and most important becoming self-aware. Awareness is a recursive form of reflection in which you realize that you are thinking, that you have an opinion of yourself, and you see the world around you as influencing your stature and survival. These are aspects that no computer systems have so far achieved … so far as we can tell. Siri has the best shot, because she was launched based on artificial intelligence research. Siri began as the SRI International Artificial Intelligence Center project, funding by the U.S. military, and was an app that Apple acquired tied to deep databases such as Wolfram Alpha (an intellectual search database), Yelp (a leading review site), and Rotten Tomatoes (the movie review site). These datasets in turn were built by hundreds of thousands of human volunteers. If you ask Siri for a movie review, she pulls in information from a review that some other human once wrote. Siri is already using insights from human minds, perhaps even your own. You don’t own an iPhone with Siri on it. You are participating in a vast study to help make Siri smarter. If any system is ever going to gather enough input to become truly artificially intelligent, what better way than to install it on mobile devices that millions of humans use, and to have us carry it around with us, informing it, every day? Go ahead, talk to Siri. She wants to hear more.